It’s hidden away so carefully behind the current exhibit “High Style” from the Brooklyn Museum Costume Collection, that I could only find it with the help of the Cincinnati Art Museum’s security staff. Ah, but it was truly worth it. Maybe the effort required to locate the display is simply a foil to impress visitors with its importance. If so, it’s working. 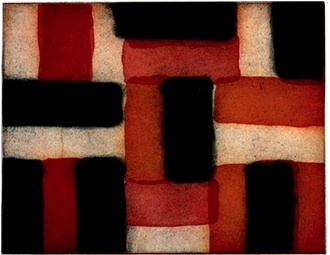 “Sean Scully Etchings for Federico Garcia Lorca” was a gift to the museum from Scully when his traveling show of large paintings appeared in Cincinnati in 2006. These eleven pages featuring abstract etchings by Scully accompanied by Lorca’s poems could not be more suited nor more complementary to each other. Scully’s sensitivity and concern with the importance of conveying light and color are perfectly suited to the emotions aroused in the Spanish poet’s words. His interpretations make no attempt to literally present Lorca’s descriptions. 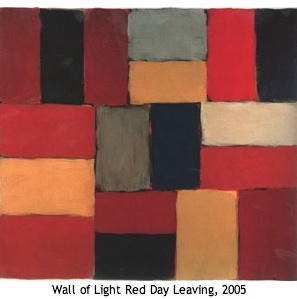 His signature style of abstract cubes and stripes, relying on color, paint quality, and composition in ever-changing arrangements, relate well to Lorca’s romanticism in words, asking the viewer/reader to follow the artists’ intentions. The wide swathe of imagination in both mediums is the key to the their successful connection. Lorca’s poetry relies heavily on metaphor, that same visual ploy that enables Scully’s abstractions to take liberties in his geometrics. The softness of Lorca’s descriptions appear in the etching methods of Scully’s prints. Foggy edges of aquatint, sugar lift and spit-bite, move about the print and interrupting edges unpredictably. The creamy light of paper shimmers in his forms adding lively textural variety. Scully’s work does not reproduce well. He manages to incorporate so much of himself into his paintings and prints that this presence is a necessary part of experiencing them. Edges of forms are cottony; suspended in fresh fog. Definitions swoop and melt with elegance that refers closely to Lorca’s descriptive style.There is a motion implied in the prints that is much less important, if seen at all, in his paintings. Time is the night’s colors. has scratched the deep blue sky. is printed in darkest blue set off with “scratches” of timid light. In Lorca’s “Beehive” he speaks of living “.. in a crystal cell, in a beehive made of air! Kiss each other through glass.” Scully then turns his spaces into a fragile echo of Lorca’s work. While most of the prints are colored subtly, occasionally one will come alive following a more vibrant theme. “Harlequin” is one of these with a hearty rust color weaving through a more positive geometric theme. This deep surprise is seen again occasionally throughout the exhibit, acting as the perfect minor key to break into the somnolent mood of the major palette. Steady returns to etching may be seen throughout Scully’s career predicting the mastery shown here. His command of the medium is obvious in the CAM’s presentation and once again, Scully has earned his stripes.